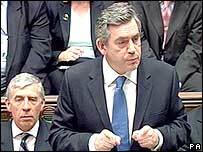 Gordon Brown has outlined a series of constitutional changes which he says will make the British government a "better servant of the people". MPs would be given the final say on declaring war and on international treaties and would have a "bigger role" in approving public appointments. Mr Brown also proposed Commons committees for each English region. He added that election day could be moved to weekends and said he would create a national security council. Linked to this he would "regularly publish" a national security strategy. His proposals - in which he suggested a "bill of rights" could eventually be published after public consultation - were not a "final blueprint" but a "route map" towards change, he said. In his first address to the House of Commons as prime minister, Mr Brown said he would "surrender or limit" powers in 12 areas, including royal prerogatives such as declaring war without parliamentary approval. But this must "never limit our ability to deal with emergencies... or operational decisions", he added. The national security council, set up within government, would "coordinate military, policing, intelligence and diplomatic action and [attempt] also to win hearts and minds in this country and round the world". Mr Brown also said the prime minister should lose the right to choose Church of England bishops. He added that MPs would hold US-style confirmation hearings for appointees to important public posts - such as the chief inspector of prisons and the local government ombudsman - and to ratify international treaties. Mr Brown said he was publishing a new ministerial code, with an adviser appointed to scrutinise ministerial conduct. He also suggested the possibility of lowering the voting age from 18 to 16 and changing the laws restricting the right to demonstrate in Parliament Square. He said: "It's possible to do more to bring government closer to the people... It can be enhanced by devolving more power to the people." He rejected the idea of only allowing English MPs to vote on English matters, saying that would create two classes of MPs. But Conservative leader David Cameron told MPs: "The British system of government needs real and lasting change." He added: "Surely he has to realise he's been at the heart of a government that, more than any other in living memory, has damaged trust in politics." And ex-Tory leader Michael Howard said devolution in Wales and Scotland had already created two classes of MPs. Lib Dem leader Sir Menzies Campbell said reform was "long overdue" and called for a full "constitutional convention" to discuss changes. Justice Secretary and Lord Chancellor Jack Straw will be responsible for seeing through any legislation needed for the changes. Earlier, he told the BBC: "What we are looking at is sensible ways in which our overall constitutional arrangements can be improved, amended. "It may sound like something rather technical and anoraky but is fundamentally about what kind of relationship people have with each other, in terms of the rights and responsibilities they have towards each other." The Hansard Society think-tank said: "Gordon Brown's proposed reforms to make Parliament more accountable to the people are a welcome step towards a strengthened Parliament and a more vibrant representative democracy." Mr Brown has said a paper on the electoral system will be published at a later stage. In the past, he has said he is not personally persuaded of the case for proportional representation in Westminster elections but would welcome a debate on reform.